TRIPOLI, Libya It began around nightfall on Sept. 11 with around 150 bearded gunmen, some wearing the Afghan-style tunics favored by Islamic militants, sealing off the streets leading to the U.S. Consulate in Benghazi. They set up roadblocks with pick-up trucks mounted with heavy machine guns, according to witnesses. The trucks bore the logo of Ansar al-Shariah, a powerful local group of Islamist militants who worked with the municipal government to manage security in Benghazi, the main city in eastern Libya and birthplace of the uprising last year that ousted Muammar Qaddafi after a 42-year dictatorship. There was no sign of a spontaneous protest against an American-made movie denigrating Islam's Prophet Muhammad. But a lawyer passing by the scene said he saw the militants gathering around 20 youths from nearby to chant against the film. Within an hour or so, the assault began, guns blazing as the militants blasted into the compound. One of the consulate's private Libyan guards said masked militants grabbed him and beat him, one of them calling him "an infidel protecting infidels who insulted the prophet." The ambiguity has helped fuel the election-time bickering in the United States ever since. The Obama administration has sent out muddled messages whether it was a planned attack or a mob protest that got out of control. A day after the attack, President Barack Obama referred to "acts of terror." He told CBS' "60 Minutes" in an interview aired the following Sunday that he believed those involved "were looking to target Americans from the start." Within 24 hours of the attack, both the embassy in Tripoli and the CIA station chief sent word to Washington that it was a planned militant attack. Still, days later, the U.S. ambassador to the U.N., Susan Rice, said the attack began as a spontaneous protest over the film. Republicans, embroiled in a heated presidential campaign, seized on the confusion. They have accused the Obama administration of being hesitant to call it a "terrorist attack" linked to al Qaeda because that would weaken one of Obama's key campaign selling points  that under his watch, al Qaeda had been weakened and Osama bin Laden had been killed..
As that debate roiled, the actual events  and their meaning  became somewhat skewed in the mouths of politicians. One assumption often made in the back-and-forth is that if the attack was planned, then it must have been linked to al Qaeda. Ansar al-Shariah, the group whose members are suspected in the attack, is made up of militants with an al Qaeda-like ideology, but it is not clear whether it has any true ties to the terror organization. Made up mainly of veterans of last year's civil war, it is one of the many powerful, heavily armed militias that operate freely in Libya and in Benghazi, while government control remains weak. Some Benghazi officials have praised Ansar al-Shariah for helping keep order in the city, even as they note its jihadi ideology. With its arsenal of weapons, the group is capable of carrying out such an attack on the consulate on its own and even on relatively short notice. 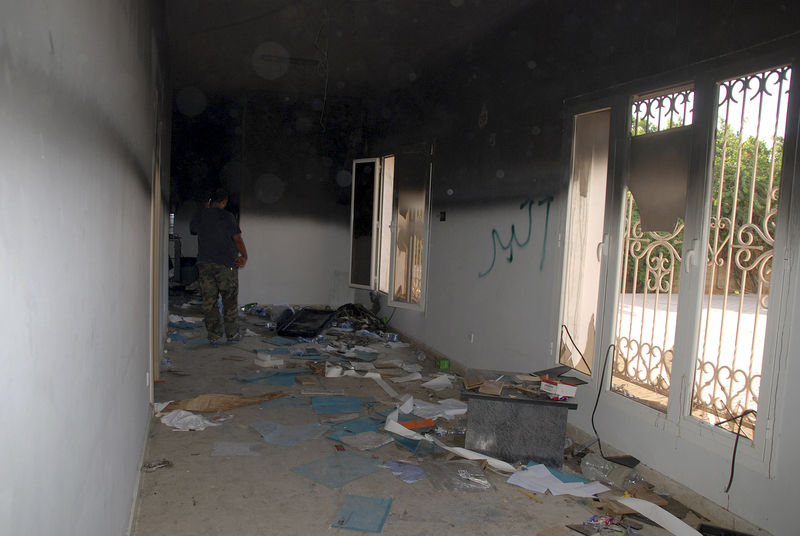 Islamist militias in Benghazi had in previous months threatened to attack the compound. U.S. officials say they are still investigating whether there is an al Qaeda connection. They say members of Ansar al-Shariah called members of al Qaeda's branch in North Africa outside of Libya and boasted of the attack. The administration has even said it is prepared to carry out drone strikes against the branch, known as al Qaeda in the Islamic Maghreb, or AQIM, if a link is proven. But the officials also acknowledge the calls alone do not yet prove AQIM was involved. A day after the Benghazi attack, an unidentified Ansar al-Shariah spokesman said the militia was not involved "as an organization"  leaving open the possibility members were involved. He praised the attack as a popular "uprising" sparked by the anti-Islam film, further propagating the image of a mob attack against the consulate. So far, the attackers' motives can only be speculated at. Yasser el-Sirri, a former Egyptian militant who runs the Islamic Observation Center in London closely tracking jihadi groups, said the attack "had nothing to do with the film but it was a coincidence that served the (militants') purpose." He believes the ambassador was the target and the attackers may have been inspired by an al Qaeda call to avenge the death of a top Libyan jihadist on the anniversary of the 9/11 attacks on the United States in 2001. But he offered no firm evidence that was the motive. The news trickled out slowly the night of the attack, with initial reports overshadowed by the storming of the U.S. Embassy in Cairo by protesters angry over the film. It was only the next morning that Stevens' death was confirmed. On the day of the attack and the next day, The Associated Press referred to it as a mob attack, based on Libyan officials' comment that there was a significant unarmed protest at the time. In reporting the following days, AP referred to it as an "armed attack" and detailed its organized nature. The past week, the AP has gathered accounts from five witnesses, including one of the embassy guards and several people living next door to the consulate compound who were present when the militants first moved in. Most spoke on condition of anonymity for fear of reprisals for talking about the attack. The neighbors all described the militants setting up checkpoints around the compound at about 8 p.m. The State Department's timeline says the attack itself began at around 9:40 p.m.
Khaled al-Haddar, a lawyer who passed by the scene as he headed to his nearby home, said he saw the fighters gathering a few youths from among passers-by and urged them to chant against the film. "I am certain they had planned to do something like this, I don't know if it was hours or days, but it was definitely planned," said al-Haddar. "From the way they set up the checkpoints and gathered people, it was very professional." The guard said he saw no protesters. He heard a few shouts of "God is great," then a barrage of automatic weapons fire and rocket-propelled grenades began, along with barrages from heavy machine guns mounted on trucks. The attackers set fire to the main consulate building. Stevens and another staffer, caught inside amid the confusion, died of smoke inhalation. The attack came from the front and the side. A neighbor whose house is on side of the consulate compound said militants with their faces wrapped in scarves attacking. Because of the checkpoints, "it felt like our neighborhood was occupied, no one could get out or in," he said. The effectiveness of the roadblocks was later revealed in the State Department's account of the evacuation. It described how the rescue force came under heavy fire and grenade attacks as they tried to leave the consulate area. They evacuated staffers to a security compound across town, where they continued to come under fire. A precision mortar hit the compound's building at 4 a.m., killing two other Americans.